Harassment does not have to be personally experienced in order to leave an impact. 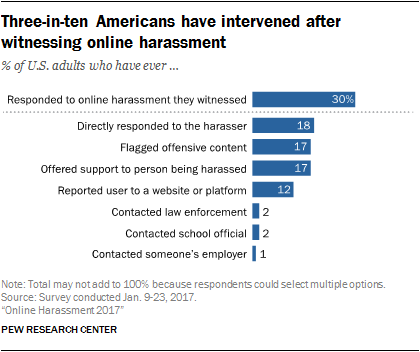 In addition to their own personal experiences, a majority of Americans have witnessed harassment directed at someone else online. This chapter explores the role these bystanders play in addressing online harassment when they see it, how often they intercede and by what means. It also explores a more subtle side effect of witnessing online harassment – whether observing these behaviors causes a “chilling effect” or prompts people to adjust their online presence and privacy settings. As noted in Chapter 2, 41% of Americans have personally experienced harassing behavior online. But an even larger share of the population – 66% in total – has witnessed these behaviors directed at others online. As was true of the harassment people experience directly, offensive name-calling and efforts to embarrass someone are the most common types of harassment people witness online. Over half of all adults (53%) say they have witnessed others being called offensive names online, and another 43% have witnessed someone being purposefully embarrassed. Smaller – though still notable – shares of Americans say they have witnessed more severe forms of online harassment. One-quarter of Americans say they have seen someone being physically threatened online, while 21% have seen others harassed for a sustained period of time. Another 18% report that they have witnessed someone being sexually harassed online and 15% say they have seen a person being stalked. All told, 39% say they have seen others experience particularly severe forms of online harassment (which includes stalking, physical threats, sustained harassment, or sexual harassment). The proportion of adults who have witnessed any form of online harassment is roughly the same as in 2014: At that point, 65% of U.S. adults had witnessed any of these behaviors and 34% had witnessed these more severe forms. Just as younger adults are more likely than older adults to personally experience online harassment, they are also more likely to see others being harassed online. Fully 86% of 18- to 29-year-olds have witnessed harassing behaviors online, compared with 60% of those ages 30 and older. Name-calling and embarrassment are the most common forms of harassment that young adults witness (69% and 60%, respectively), but their exposure to more severe forms of harassment is especially striking. About six-in-ten adults ages 18 to 29 (62%) have witnessed some form of severe harassment online: 42% have seen others make physical threats, 36% have witnessed sustained harassment directed against someone, 35% have seen sexual harassment and 28% have witnessed stalking online. Younger adults are much more likely to witness each of these behaviors compared with adults 30 and older. Still, the exposure to online harassment that older adults witness is notable. 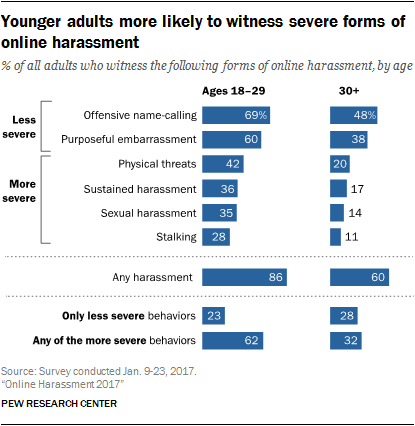 About three-quarters of those ages 30 to 49 (78%) and half of adults 50 and older (48%) say they have witnessed some form of online harassment. In particular, substantial minorities of adults 50 and over have seen others called offensive names online (35%) or witnessed someone purposefully being embarrassed (29%). Witnesses to harassment can often play a decisive role in someone else’s harassment online by choosing to intervene or offer their support. This survey finds evidence that a portion of Americans have indeed taken action after witnessing harassment online – although a similar share has seen these behaviors but never taken any action to address it. Three-in-ten U.S. adults (30%) say they have ever responded or taken some sort of action after witnessing potentially harassing behavior directed at someone online. Meanwhile, 35% have witnessed this type of behavior but have never responded to it. The remaining 24% of adults have never witnessed any type of harassing behavior online in the first place. The specific steps that people take to respond to harassment of others tend to fall into three categories. In some cases, they reach out to either the attacker or the victim directly: 18% of Americans have directly responded to the perpetrator of harassment, while a similar share (17%) has offered support to someone they thought was being harassed. In other instances, they elect to utilize technological solutions such as flagging offensive content (17% of all adults say they have done this in response to witnessed harassment) or reporting someone to a website or online platform where harassment was taking place (12%). Relatively few say they have gone even further after witnessing an online harassment incident by contacting law enforcement (2%), a school official (2%) or someone’s employer (1%). Observing harassment online can lead to a number of potential negative consequences. Witnesses may feel anxious or unsafe about their own interactions or participation online, and many are concerned that widespread harassment contributes to an environment in which people are scared or unwilling to speak freely for fear of retribution. This survey finds evidence of both of these outcomes. 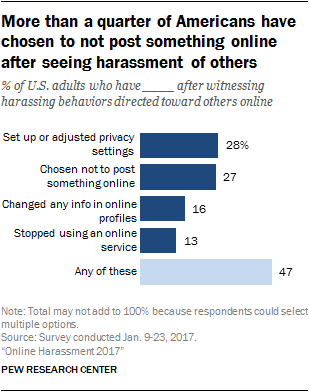 Almost three-in-ten Americans (27%) say that witnessing online harassment of others has caused them to refrain from posting something online, while a nearly identical share (28%) say it has encouraged them to set up or adjust their own privacy settings. In addition, 16% have changed the information in their online profile(s), 13% have stopped using an online service after seeing these behaviors and 3% say they have taken some other step beyond the four listed here. In total, roughly half (47%) of all adults have taken at least one of these steps as a result of witnessing harassment of others. Younger adults are especially likely to engage in this sort of “profile management” after witnessing harassment online: 47% of adults ages 18 to 29 have adjusted their privacy settings for this reason, while 30% say they have changed some of the information in any of their online profiles. And an especially large share of women ages 18 to 29 (45%) have chosen to not post something online after witnessing harassment of others. Exposure to the online harassment of others also can lead to personal and emotional impacts. For instance, nearly one-in-ten adults (8%) report that they have felt “very anxious” after witnessing harassing behaviors online because they were worried they might be targeted for similar treatment. Another 26% say they have felt mildly anxious, but not overly so, after seeing these behaviors online. These feelings of anxiety are present at some level across a relatively broad cross-section of Americans, but are especially prominent among younger adults. Nearly half (49%) of those ages 18 to 29 have felt anxious after witnessing online harassment directed toward others, with 12% indicating that they have felt “very anxious” at one point or another that something similar might happen to them. Whether someone has personally experienced online harassment themselves is highly correlated with how that person responds and reacts toward online harassment happening to others. This is especially true for people who have encountered severe forms of harassment, such as stalking, physical threats, sexual harassment or harassment over a sustained period of time. Those who have experienced severe forms of online harassment are also more responsive when they see others targeted online. Almost two-thirds (63%) of those with severe harassment experiences say they have taken some type of active step to respond after seeing someone else targeted online, including directly responding to someone’s harasser (44% have done this), offering their support to the target (42%), flagging offensive content (42%), reporting the offender to a website (36%) or contacting law enforcement (9%). These responses are all less common among both those whose harassment does not include severe behaviors, as well as among those who have not experienced any online harassment at all. Likewise, those who have been the target of severe forms of harassment are especially likely to take steps to protect their online presence after seeing others being harassed. More than half of those with severe harassment experience (56%) have adjusted their privacy settings after witnessing harassment, 42% have changed the information in any of their online profiles and 30% say they have stopped using an online service because of harassment concerns.